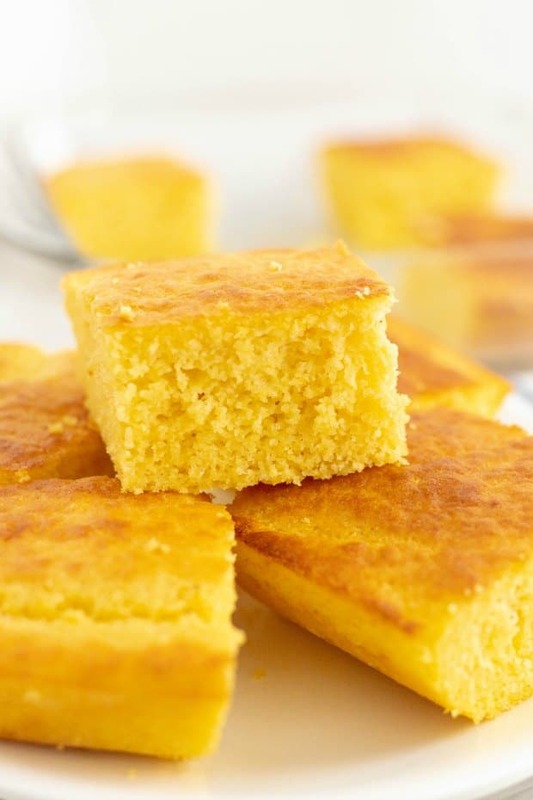 Who doesn’t love an easy cornbread recipe? But with so many recipes available, it’s hard to know which one is the best. For us, the best cornbread recipe is one that is not only delicious but also quick and easy to make. This recipe passes all the tests – easy, delicious, quick, and homemade. To me, when you pair a bowl of hearty chili, Chili Mac and Cheese or delicious soup with a yummy piece of cornbread, it is an instant comfort. Our cornbread recipe could not be easier. With only 5 steps, before putting it in the oven, it is a fast, made from scratch bread that goes well with so many main dishes. One that everyone at the table is sure to love. A good cornbread is often served with meals like beer BBQ chicken or a nice hearty chili. These are foods that have a tendency to bring people together around a table. I would argue, that cornbread is the best complement to just about any dish. First, you will want to mix together the flour, cornmeal, baking powder, baking soda, salt, and sugar in a bowl and set it aside. It will work best if you use the larger bowl for this mixture since you will be adding to it. Next, in a separate bowl (the smaller bowl of the two), whisk together the buttermilk, butter, and slightly beaten eggs. Then, pour the wet mixture (the second mixture you made) with the dry ingredients (from the first mixture). Stir them together well. The batter will be lumpy after this. 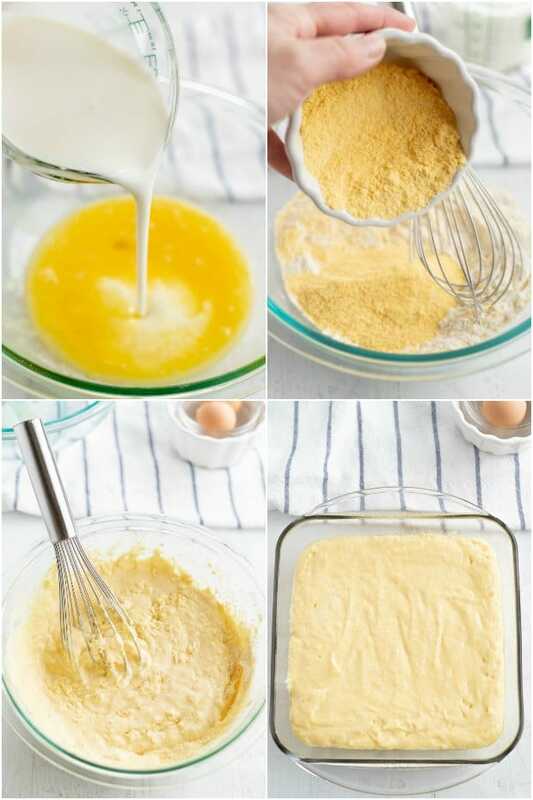 After you’ve mixed the wet and dry ingredients together to make your batter, you will want to spread the batter evenly into a lightly greased 8 inch baking dish. It works well to do this with a spatula, to make sure you get the entire mixture. Then, I use the spatula to even out the top of the mixture in the baking dish. Bake on 425 degrees for about 20-25 minutes. Keep an eye on it. You want it to be golden brown when it’s finished. Test the center of the cornbread with a toothpick to make sure that it comes out clean and the bread has baked through. After taking it from the oven, let the bread cool for about 15 minutes before serving. 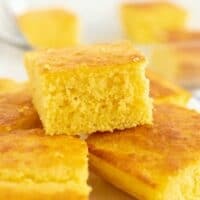 The texture and taste of cornbread is unique. It’s what makes it a favorite of so many. We, like many others, think a good cornbread should be a little bit crumbly. Just the right amount! However, if you’re not a fan of crumbly cornbread, more flour will make it less crumbly. Whereas more corn meal will make it more crumbly. 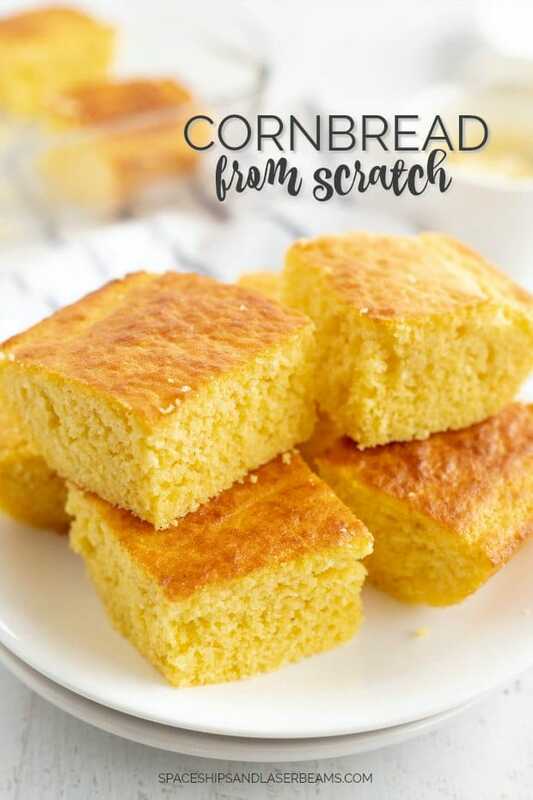 You can tweak this a little bit to make your cornbread the texture you prefer! We’ve got the perfect combination of both to provide just enough crumble to your delicious bread. So, if you like it just the right amount of crumbly, like us, just follow the recipe exactly. The beauty of cornbread is that it’s so versatile. You can keep things simple and serve it warm, with just honey or butter. Hot out of the oven with melted butter and gooey honey drizzled on the top, my mouth waters just thinking about it. It also makes a wonderful addition to a side with any soup, especially a homemade chili. And we can’t forget the big BBQ gatherings or birthday parties. Cornbread must be in attendance at any good grill out. 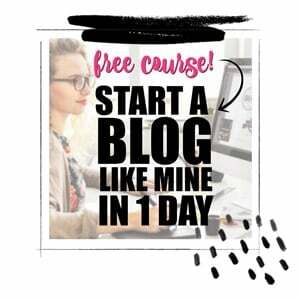 If you’re taking this recipe to a large gathering, you may want to consider doubling the batch. A single batch might not last too long. No matter what you pair your cornbread with, it’s best enjoyed among good company. For us, the best cornbread recipe is one that is not only delicious but also quick and easy to make. We are pretty positive we have found a winner. This is the best cornbread recipe. It passes all the tests - easy, delicious, quick, and homemade. Pour the wet mixture together with the dry ingredients and stir. Batter will be lumpy. Spread batter evenly into a lightly greased 8 inch baking dish. Bake on 425 degrees for 20-25 min. It should be golden brown. Test in the center of cornbread with a toothpick to make sure it comes out clean. This was so good and moist and great paired with chili! 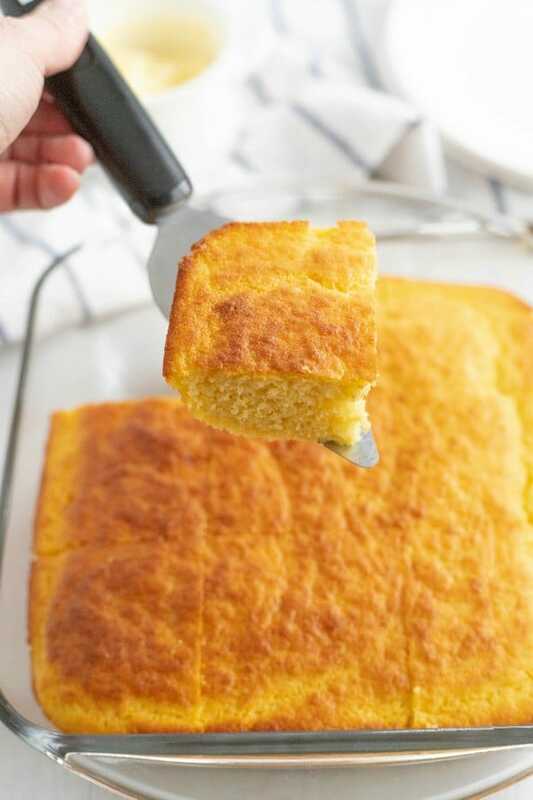 This is the perfect cornbread recipe, we love it!